Mark your calendars – it’s almost Galentine’s Day. If you need a refresher about the origin of this glorious holiday, we’ll remind you that this occasion was first coined by Leslie Knope, a character from NBC’s hit comedy Parks and Recreation. In Season 2, Episode 16, Knope was throwing her annual Galentine’s Day party on February 13. This occasion was created to celebrate female friendships, a day purely meant for appreciating gal pals. Basically, this day is a reminder that even if you’re single on Valentine’s Day, you’re still loved and appreciated – not to mention there are tons of other people in your life that can buy you cheap heart-shaped candy from Shoppers and a mickey of Fireball Cinnamon Whisky. Since Knope first proclaimed the holiday back in 2010, Galentine’s Day has become synonymous with celebrating the bonds between soul sisters, and seven years later, the tradition lives on. Here are six food and drink-related things to do in Vancouver to celebrate Galentine’s Day. Artisan SakeMaker produces handmade small-batch fermented sake made from top-of-the-line Japanese Junmai rice and pressed and bottled by hand. Osake is premium sake made from all natural and local ingredients from the sake maker Masa Shiroki’s own rice winery. This small hidden gem has big flavour in its exceptional baked goods. Head here with a buddy and split one, two, or three of the offerings up for order including old-fashioned chocolate cake and white chocolate cheesecake. Cacao 70 has a plethora of sweet treats that are perfect for a Galentine’s celebration. 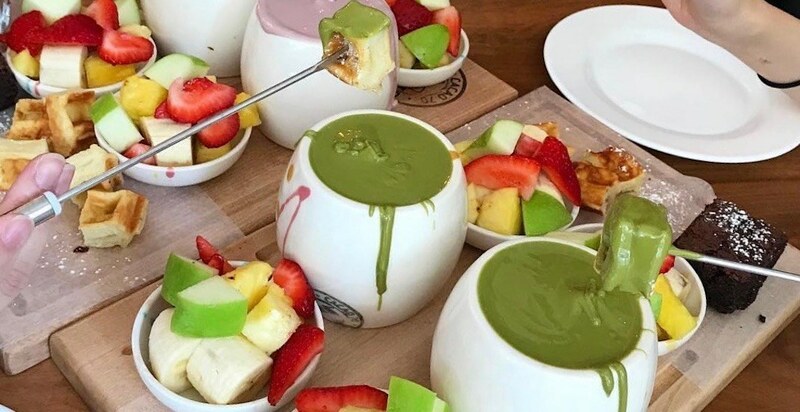 Heading to Cacao 70 for a dessert pizza, an ice cream cup, or a chocolate fondue is a pretty awesome way to celebrate friendship if you ask us. Get bad and bougie on G-day by shopping at Holt Renfrew and then hitting the Colette Grand Cafe when your post-shopping hanger kicks in. This spot has a killer brunch along with delicious desserts and cocktails. If you’re like many of us who can’t afford to shop and eat – we say skip straight to the mimosas and your Galentine’s at Holts will still be wonderful. If you and your friends would rather drink hard liquor than tea, there are a ton of local distilleries you can head to on Galentine’s Day. If you happen to be near Granville Island, The Liberty Distillery is a great place to stop in for a gin tasting flight. Keep the festivities going and wash that quality liquor down with one of the distillery’s artisan cocktails (we recommend the Caesar) and you’re in for one memorable celebration. If you don’t already head to UVA for cocktails with friends regularly, this is a great activity to get involved in for Galentine’s Day. This spot has wine flights, bubbles flights, and an awesome selection of wines and artisan cocktails.